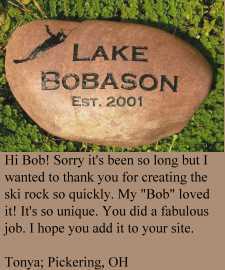 View some examples of our engraved river rocks below. We receive many requests for engraved memorial stones to be placed in a memorial garden or a designated space in ones yard that has been landscaped with flowers or sometimes a small fountain. Some of the sentiments engraved in stones are quite touching and most certainly bring warm memories for years to come. One person had a great idea, shown below, of engraving a large river rock in tribute to her Grandfather along with smaller river rocks describing his many wonderful qualities. Some other examples of engraved river rocks are affirmations or reminders that have simple statements such as Serenity or Dream engraved in stone. The engraved river rocks that welcome Hummingbirds and Butterflies into ones garden are always a nice touch. Usually sent within 3 days. Pressing deadline? Let us know and we will do our best to accommodate you! If any of the examples below give you an idea of what you would like to see engraved on a large river rock, please fill out the order form below. And if you need help, just give us a call at 509-715-0630. All of the large river rocks are $160. That includes all the engraving, words or graphics, as well as Priority Mail insured shipping.